Hedda Gabler and Other Plays by Henrik Ibsen, English Prose. Three plays by Norwegian author Henrik Ibsen. 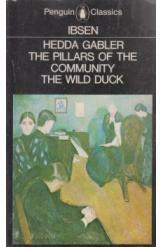 Includes "Hedda Gabler," "The Pillars of the Community," and "The Wild Duck." Book is in good condition, all pages intact.